GoPro releases HERO+ camera for $199.99 with Wi-Fi connectivity. 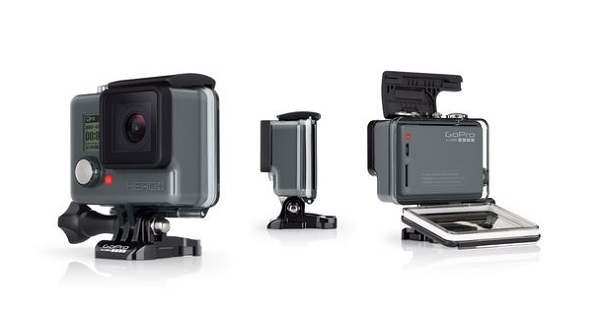 GoPro today announce the release of its new Wi-Fi and Bluetooth enabled HERO+ camera. At $199.99 (MSRP), the HERO+ is waterproof and mountable as well as compatible with GoPro's vast array of mounts and accessories. GoPro's HERO+ captures stunning 1080p60 and 720p60 video and 8MP single, Time Lapse and Burst photos with the same impressive image quality that GoPro has become famous for. HERO+ most notably features Wi-Fi which allows it to connect with GoPro's mobile app and benefit from convenient tools such as a Trim & Share feature that allows the user to quickly create and share short video clips across leading social media channels. HERO+ is integrated into an ultra-durable waterproof housing that delivers GoPro's legendary durability and versatility. HERO+ will be available at authorized retailers around the world and on GoPro.com beginning October 4, 2015.